same old stuff as the seasons before it i like every new season because while same concept the randomness always keeps it refreshing for me to watch no matter it wasn't interstellar or amazing its a just a fun watch if u want some adrenaline filled anime to boost your energy that day. 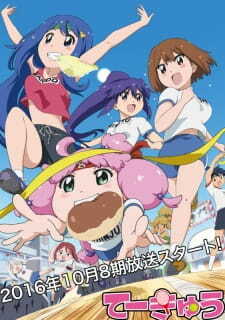 Art 7/10: i mean what do u expect honestly from teekyuu, 2 min an episode so much fast paced wacky cocaine induced action of course the animation won't be the best but for what it is it was not bad i did not have a hard time watching it because of art it was just fine for what it does i was expecting worse from these type of fast paced shows but they did good. sound 8/10: for the wackiness of this show the art was superb because it expressed what teekyuu is all about and considering this is the 8th season I am surprised they still kept this consistency of sound quality throughout the whole 8 seasons that it has been airing. character 8/10: the characters are so fun and amazing they are the reasons why i get my good chuckles because they are so fun and strange unique all interesting to watch all act comedic and stupid. Enjoyment 7/10: this was really enjoyable it wasn't something ill remember and be impact but it was a fun watch throughout either way. Overall 7/10: this was super fun to watch not something impactful or amazing like i said its just fun if you want to have a fun time or have some free time or just want some adrenaline in your system then you have come to the right place for some wacky fast fun packed into 2 min episodes enjoy the 8th season of this cocaine induced ride (please 9th season come out soon). If you're here and you have seen the first few seasons, you probably liked them. Well, rest assured, because this does not change what the show already has going. A this point, it's very consistent. 2016 gave us no shortage of great new titles to shower love over. Here's a list of the 10 best series from 2016 that make up for in quality what they lack in run-time.